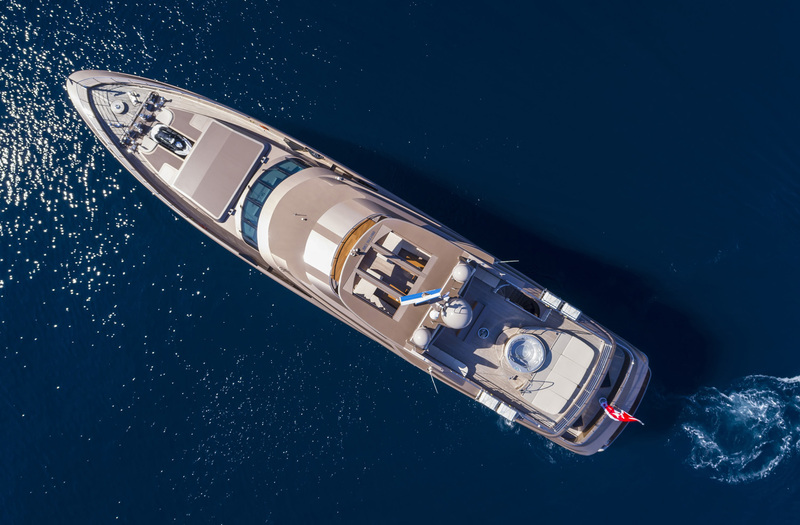 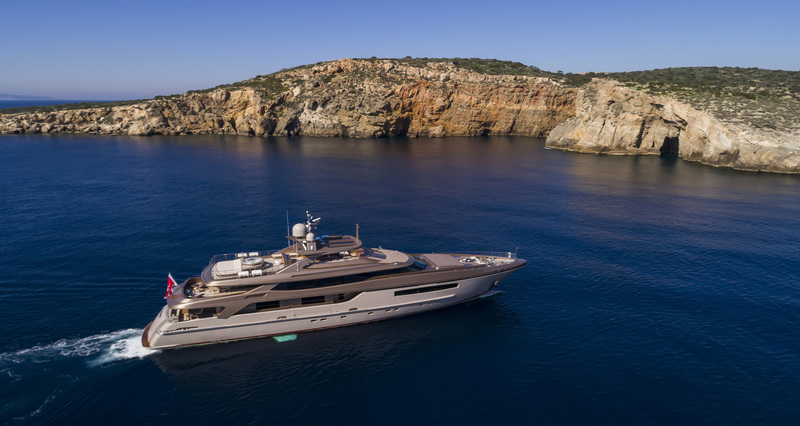 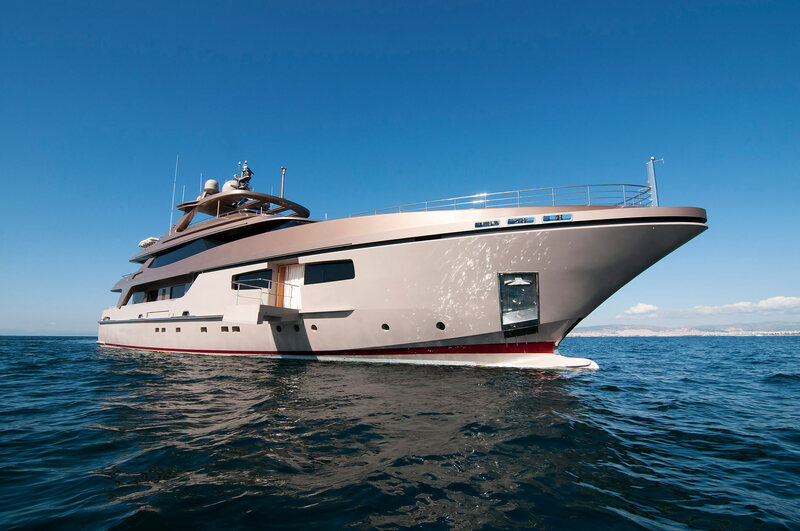 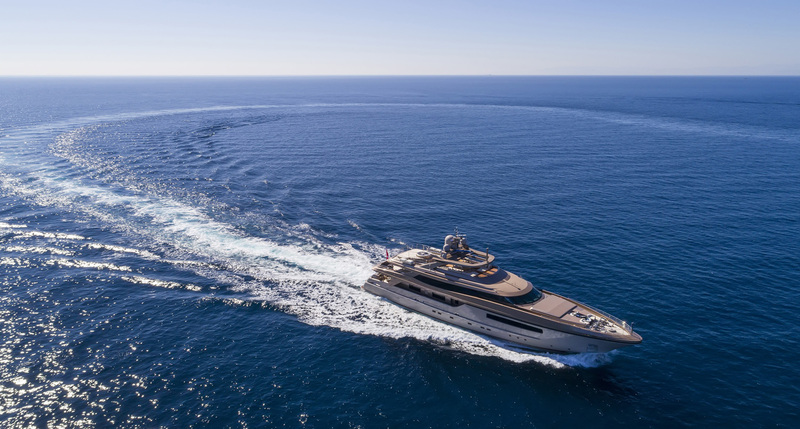 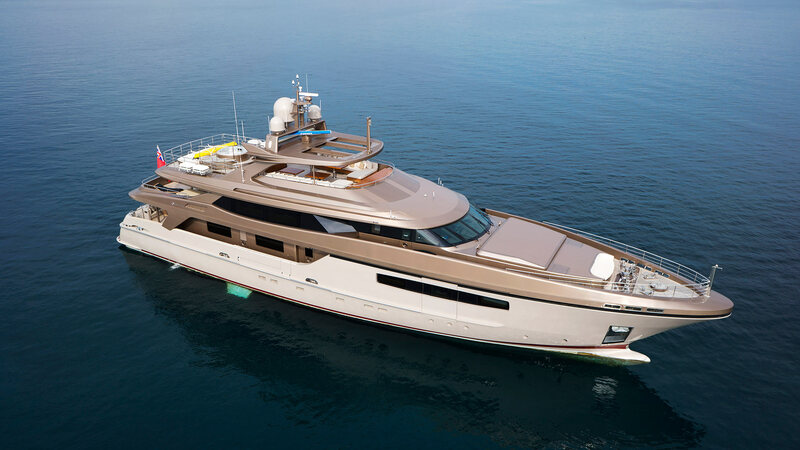 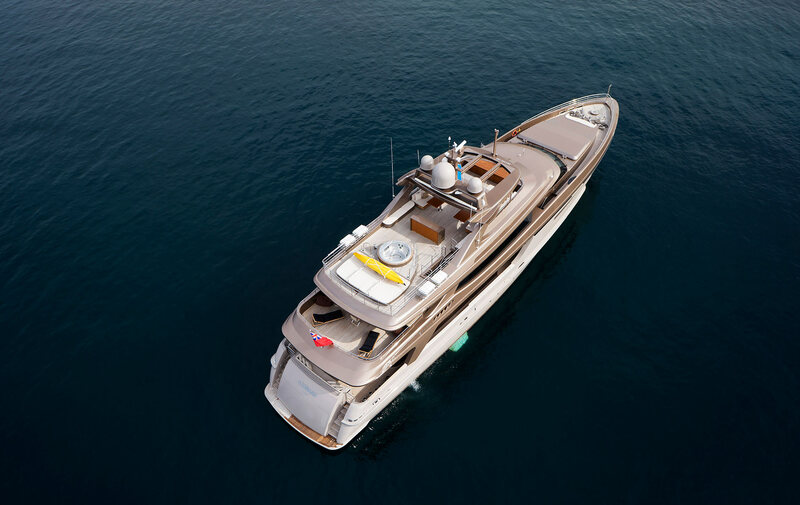 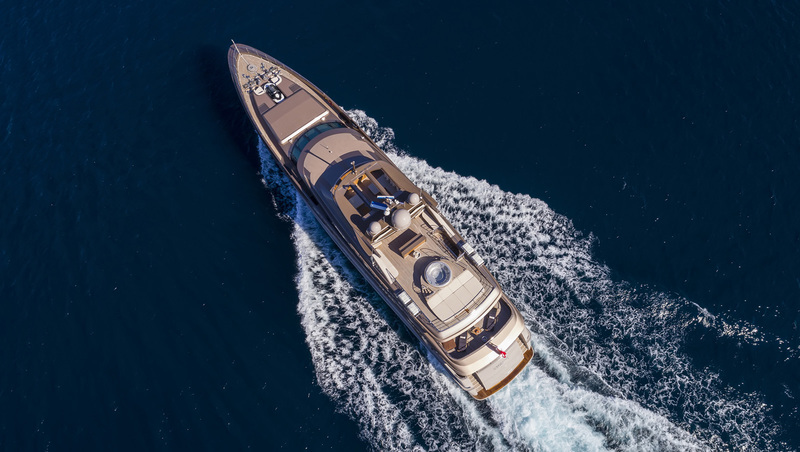 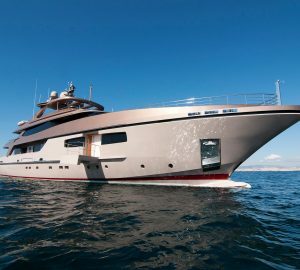 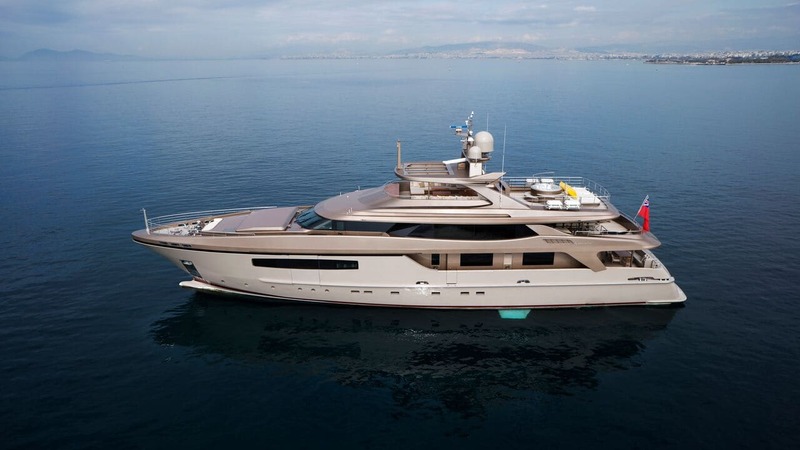 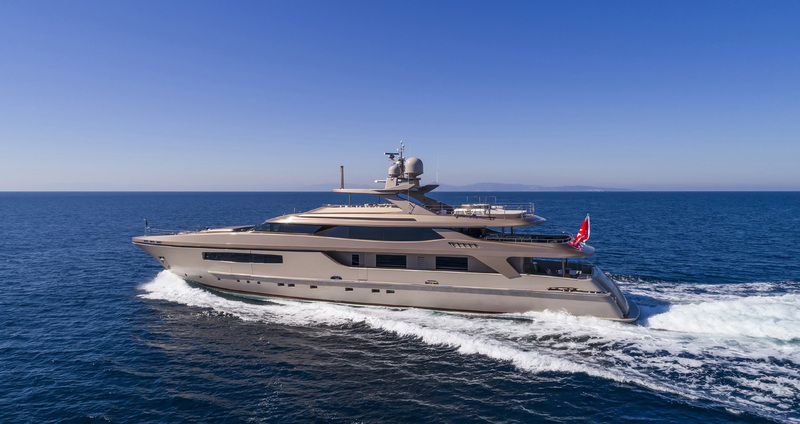 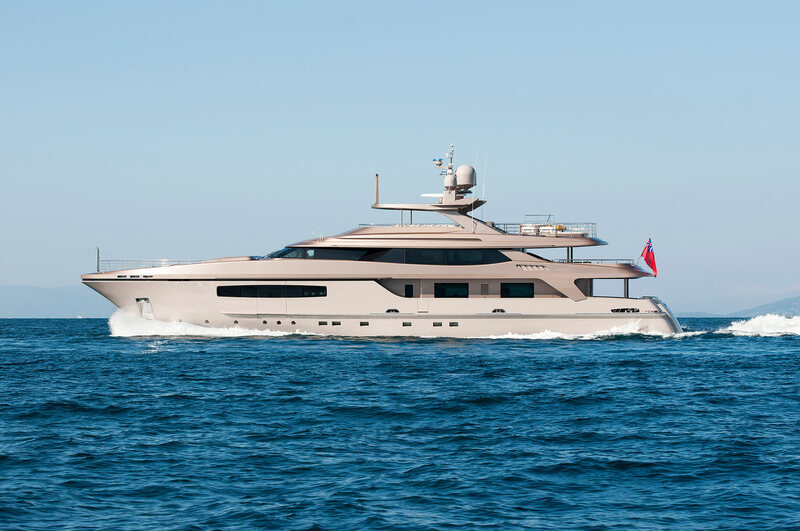 Launched in 2011, the 43-metre motor yacht GEOSAND is a lovely planning charter vessel, built by the respected Italian manufacturer, Baglietto. 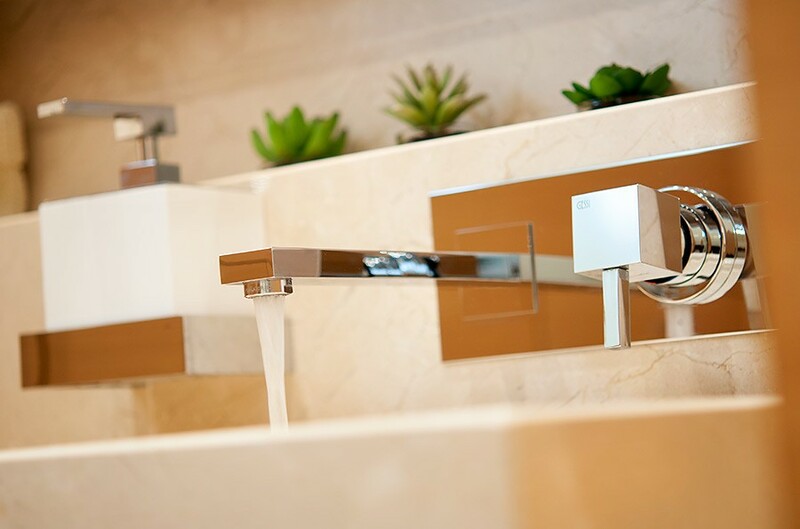 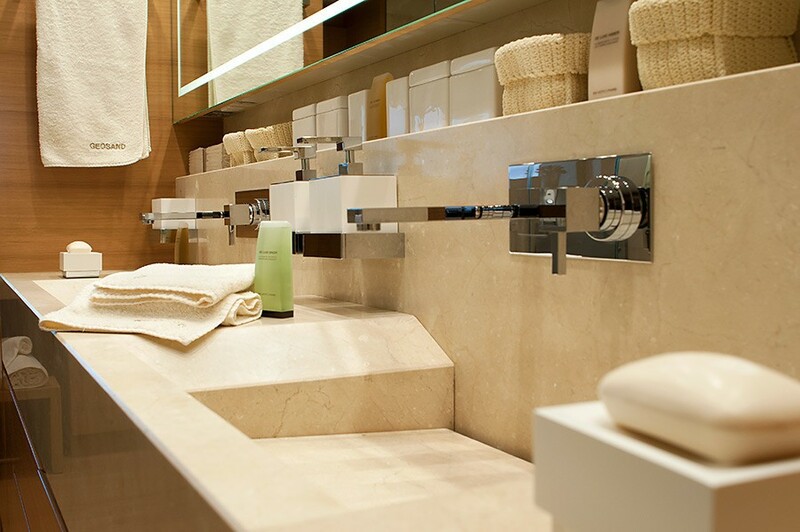 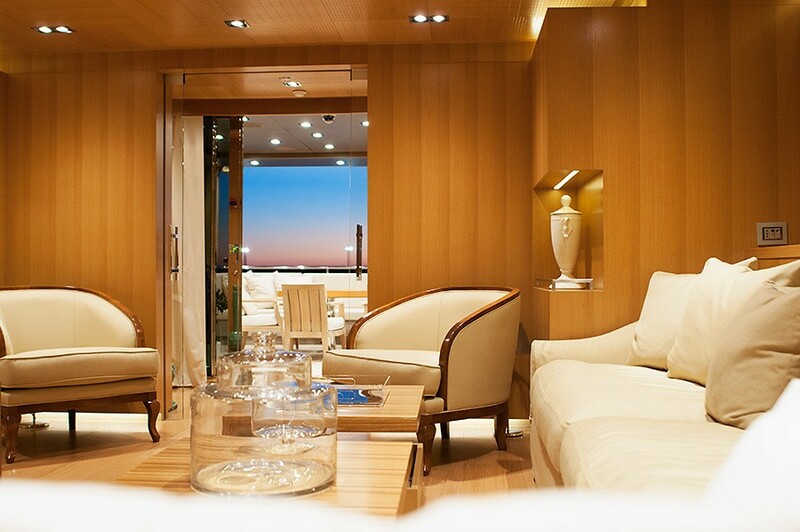 GEOSAND boasts both a sophisticated exterior as well as a beautiful interior by renowned Francesco Paszkowski. 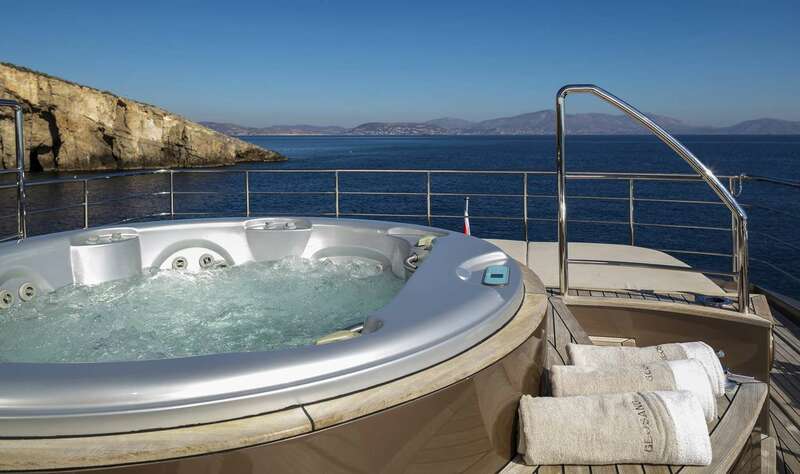 She offers accommodation in 5 - 6 stunning and spacious cabins, for up to 12 guests. 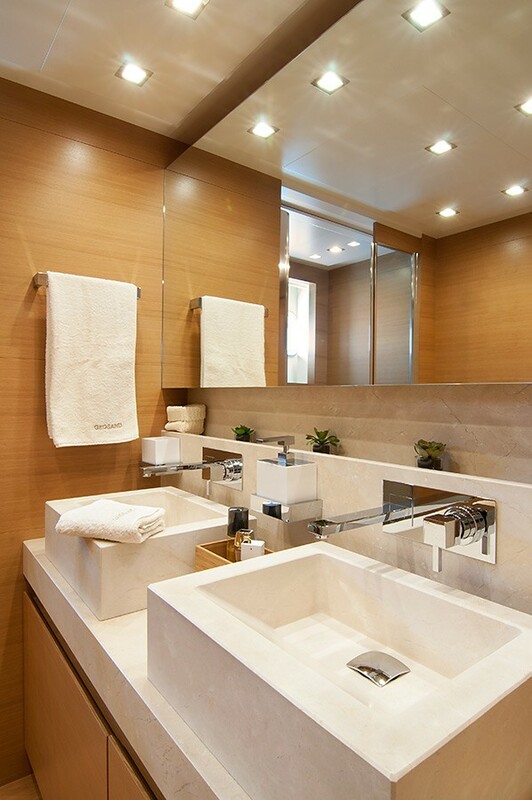 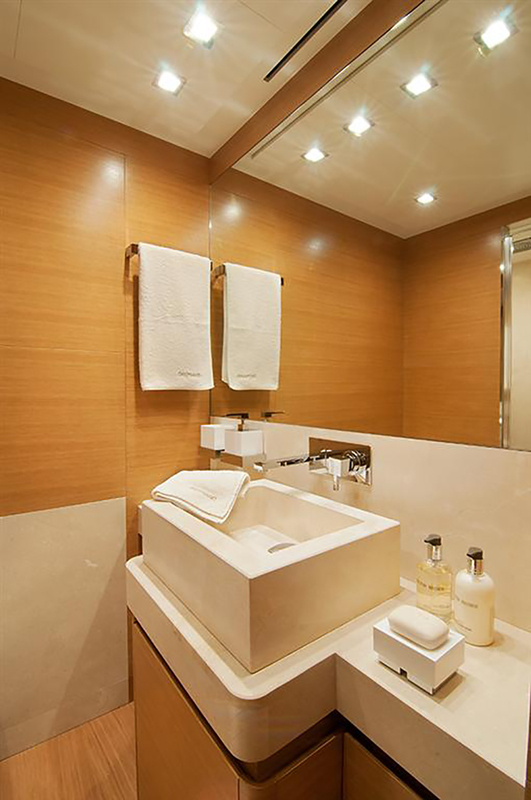 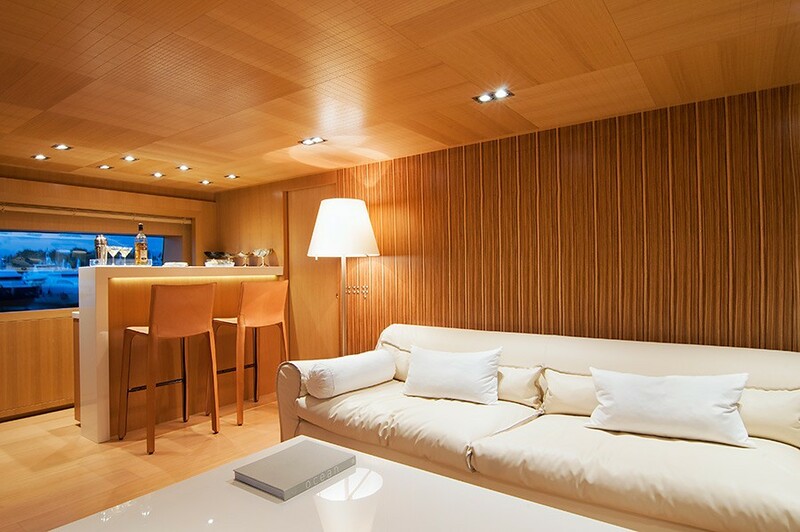 The interior ambiance is elegant and refined. 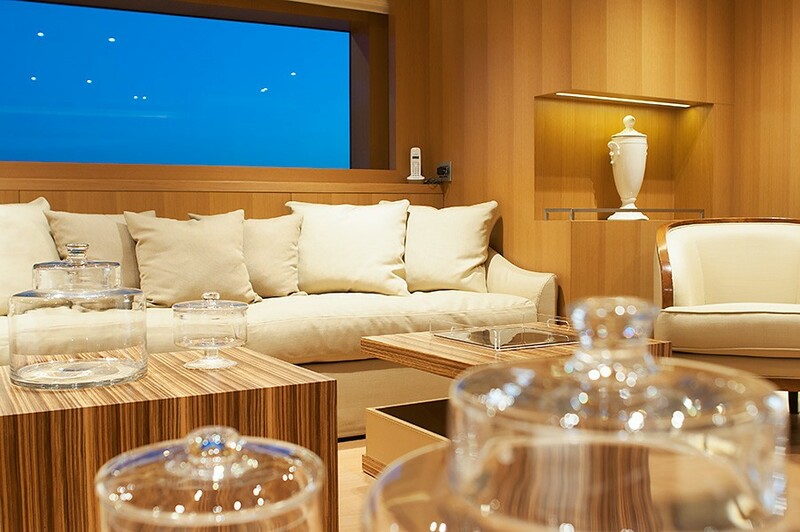 Contemporary soft furnishings throughout are matched with exquisite wood finishes, creating a warm welcome and bespoke atmosphere. 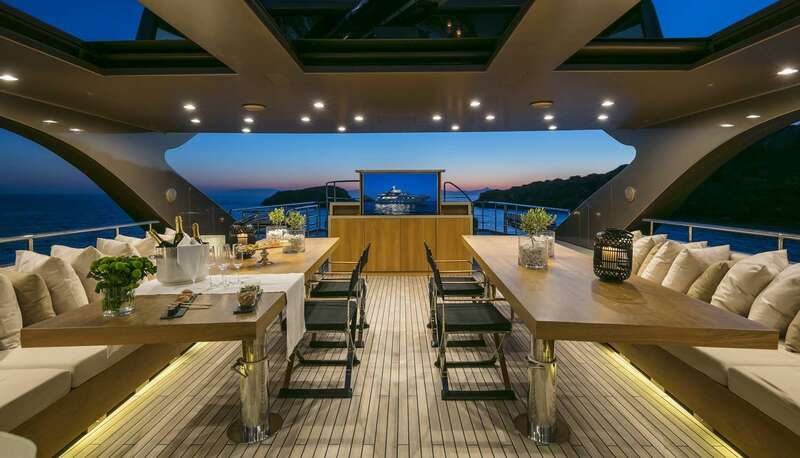 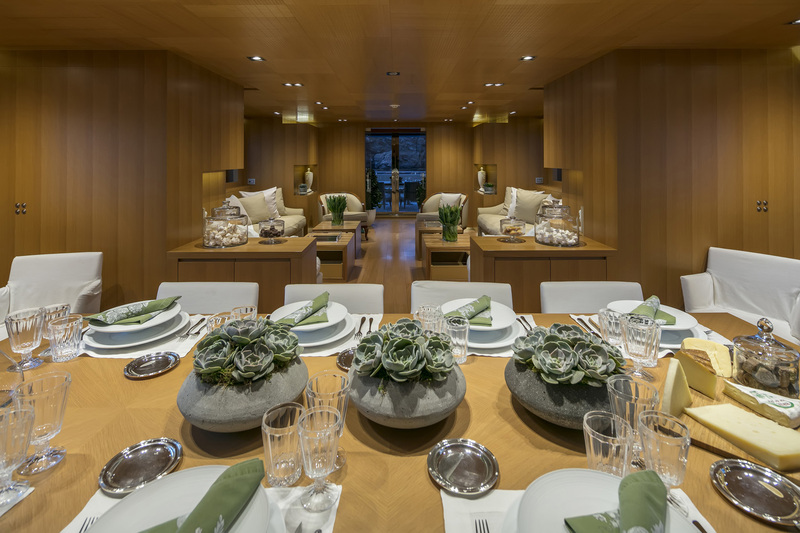 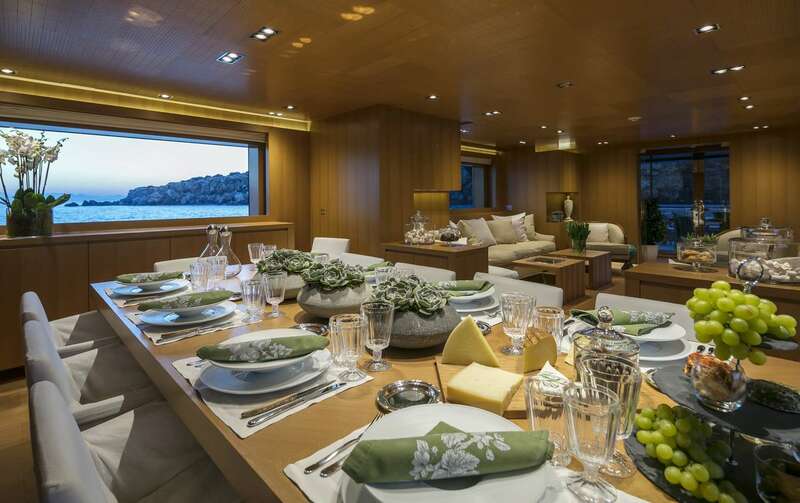 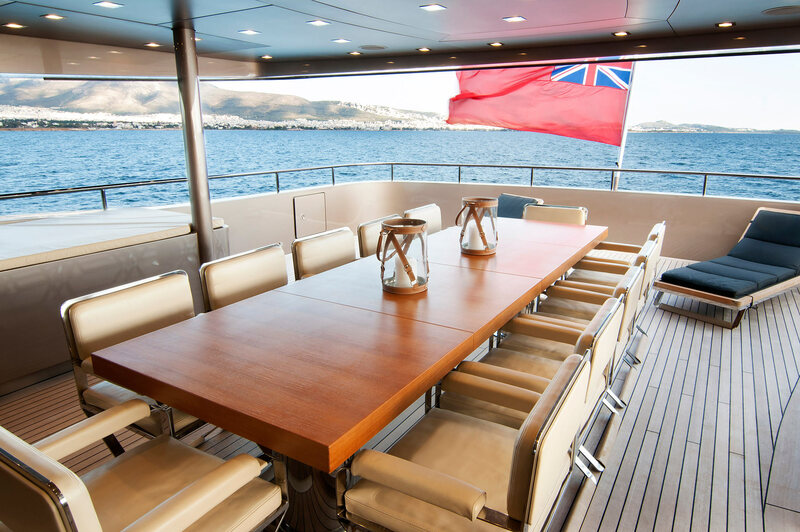 On the main deck are the generous salon and open plan formal dining. 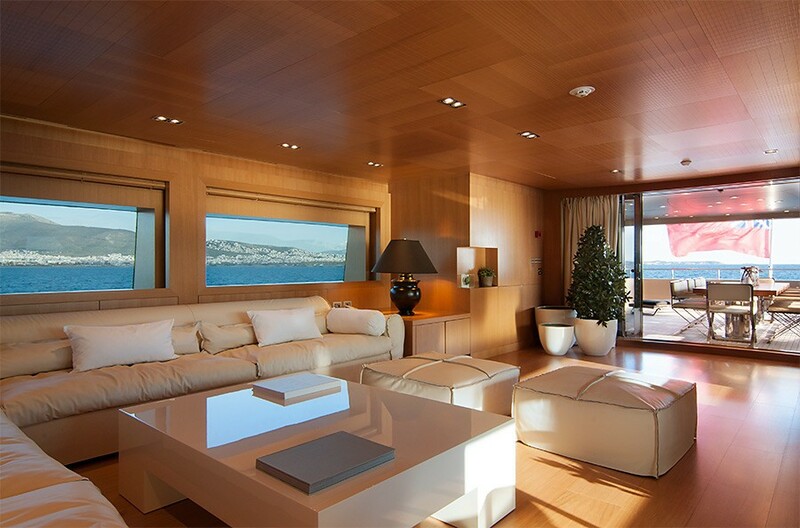 Panoramic windows infuse plenty of natural light into space. 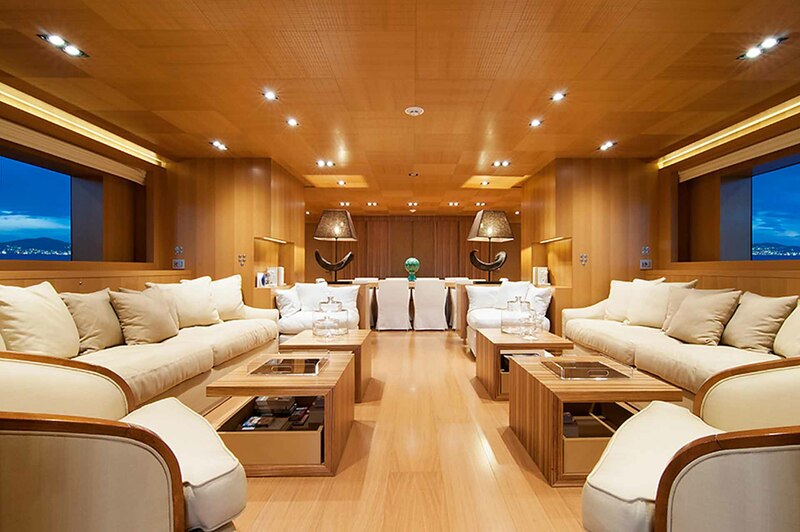 The salon aft features two plush opposing sofas, occasional chairs, and glass inlaid coffee tables. 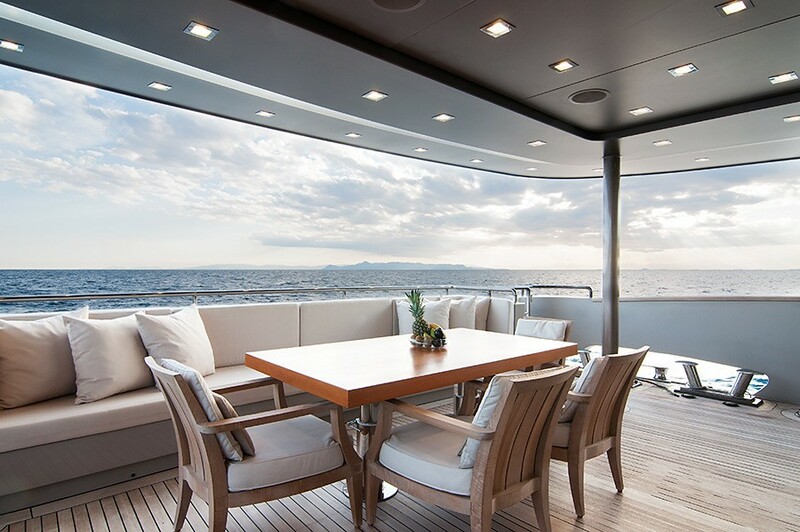 Forward, the formal dining table seats guests in style. 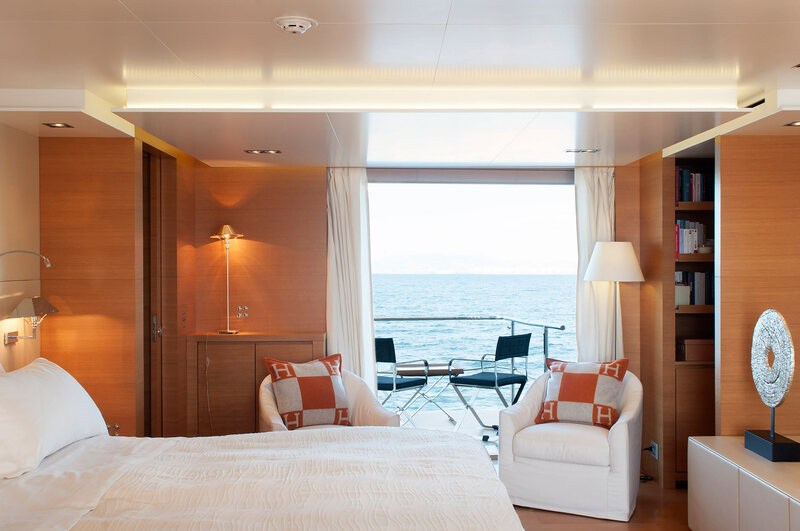 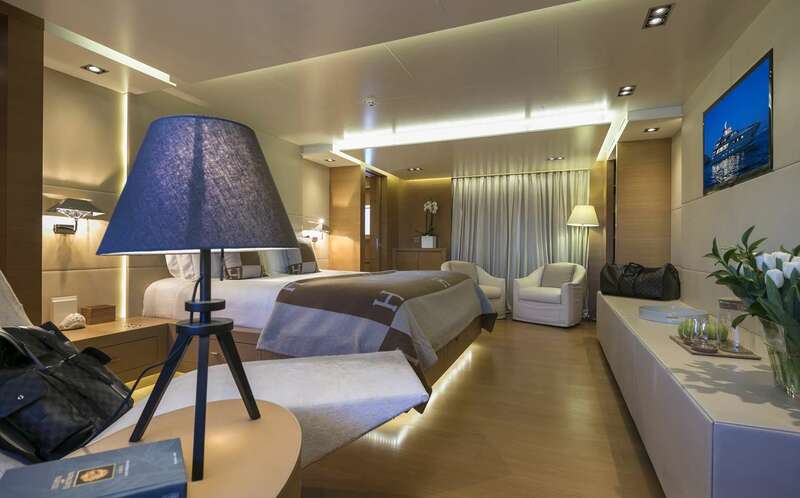 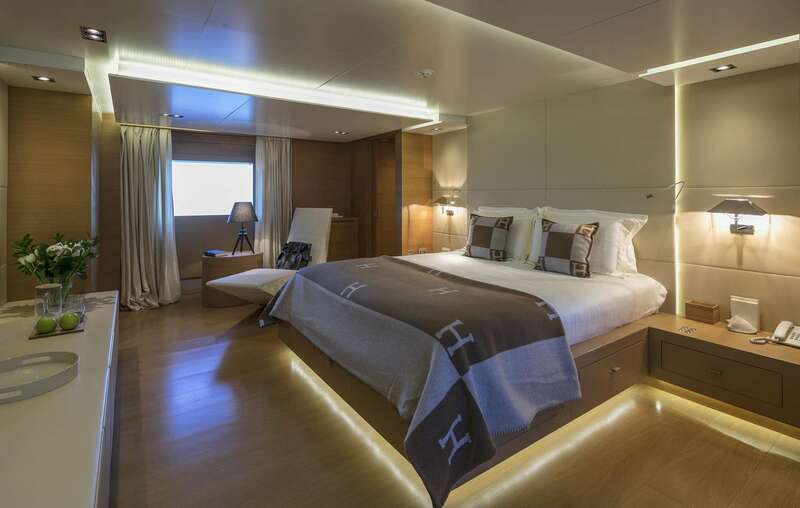 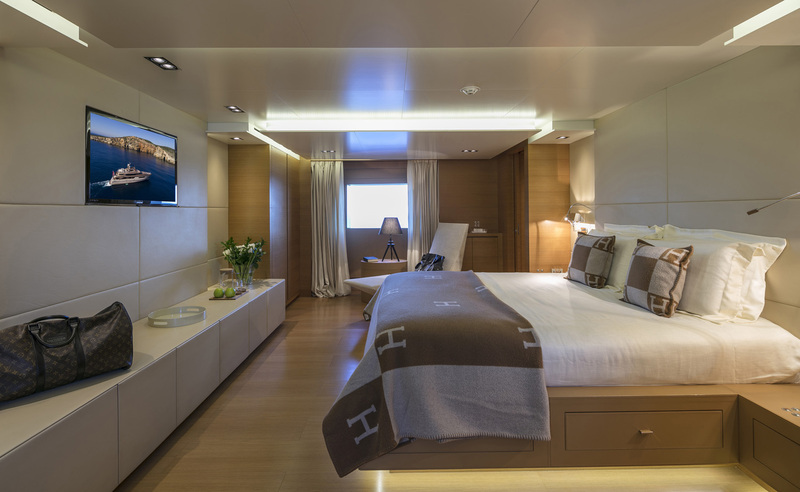 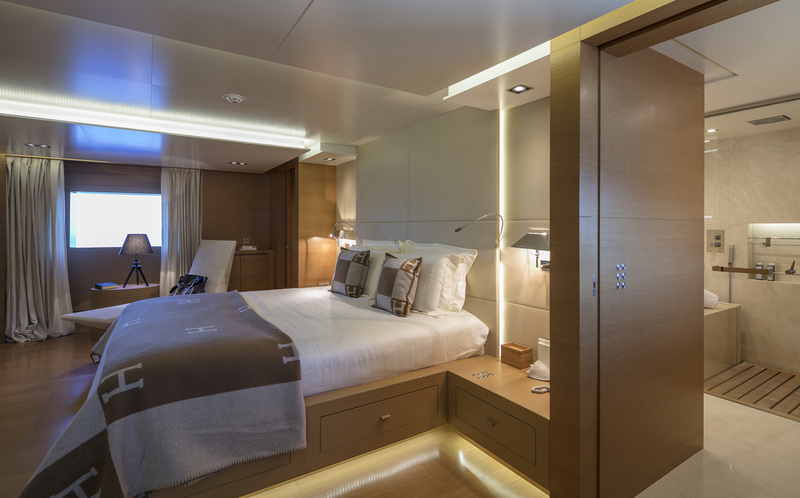 Further ahead is the full beam master stateroom, complete with a king size bed, study, sofa, vanity, walk-in wardrobe and two private balconies. 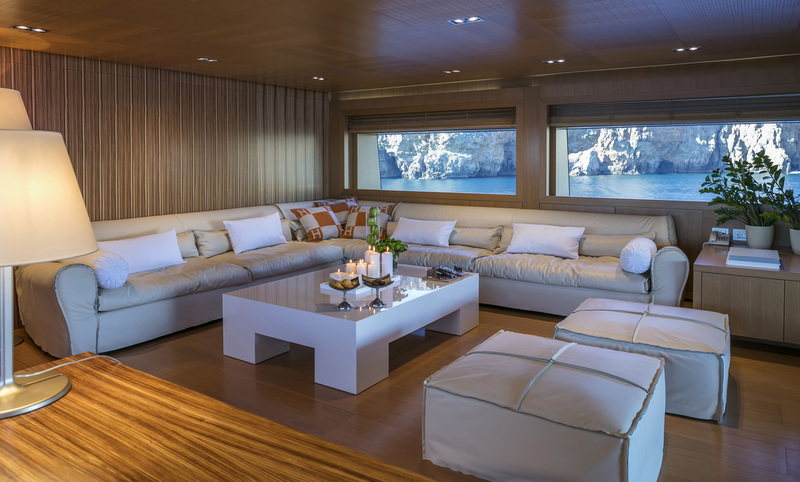 An upper salon has a more casual feel, with a large L shaped sofa, seating, ottomans, coffee table and wet bar. 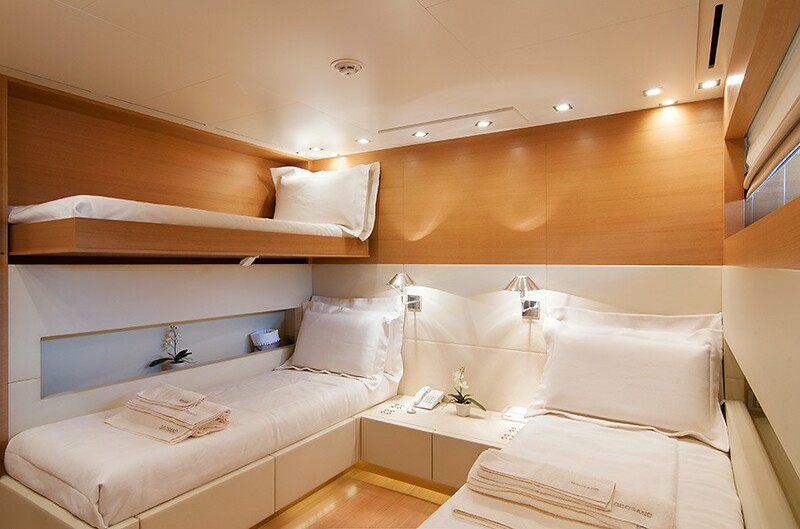 On the lower deck are two VIP and 2 twin cabins. 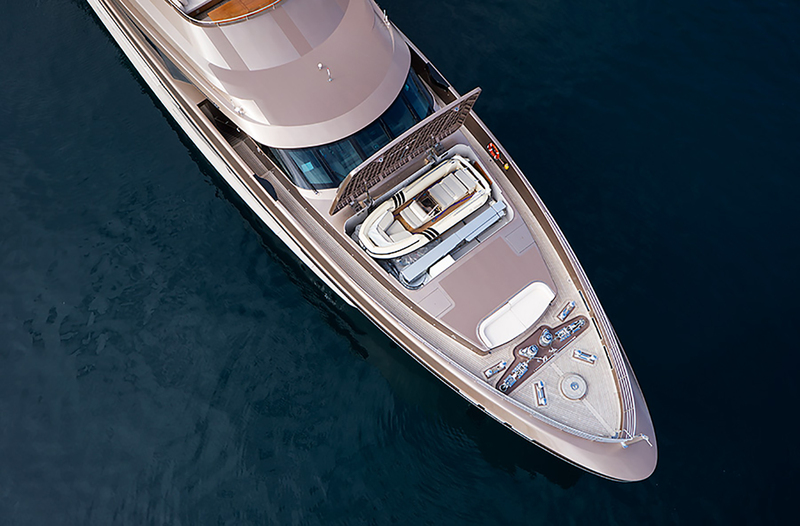 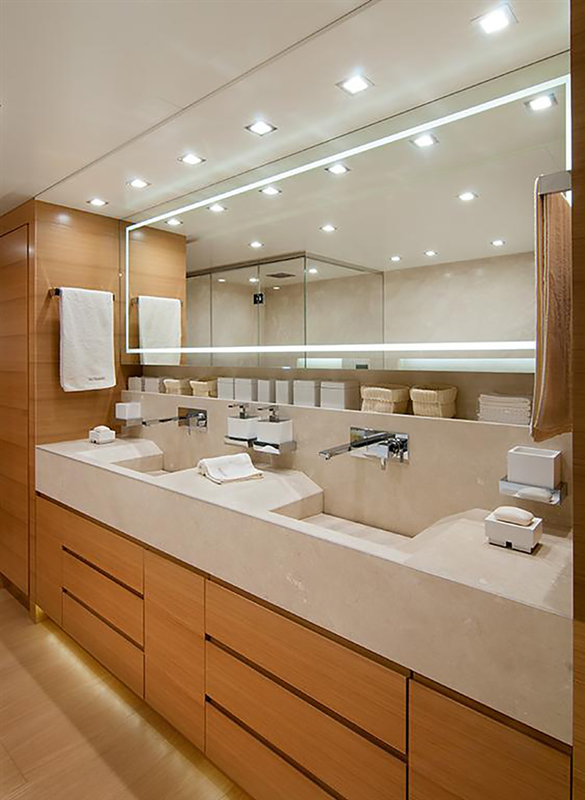 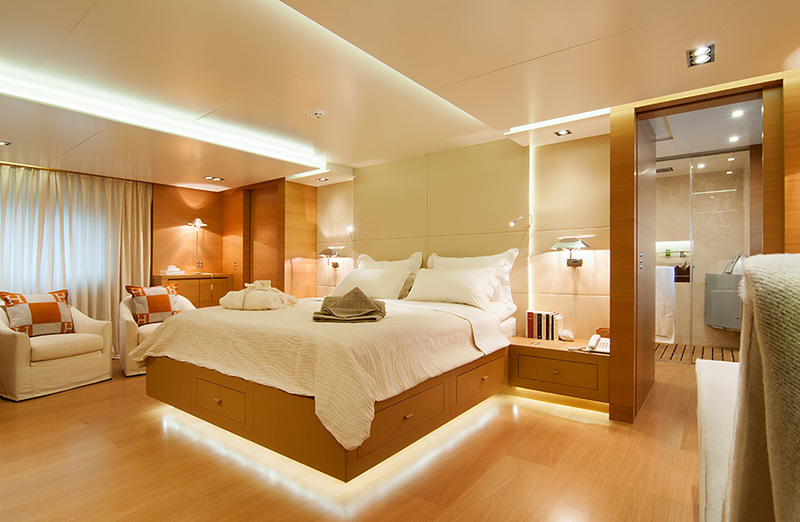 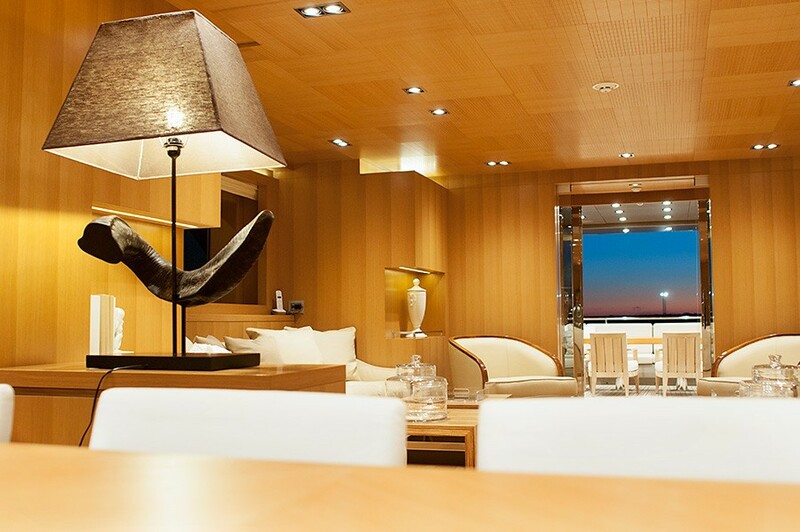 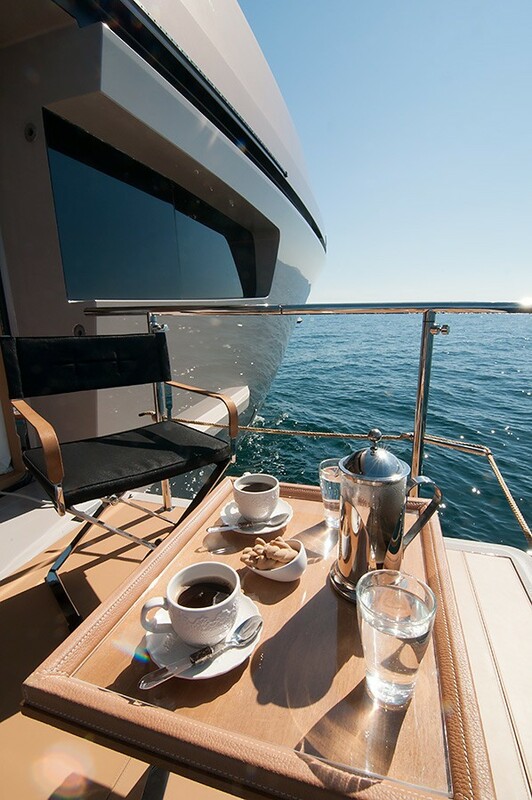 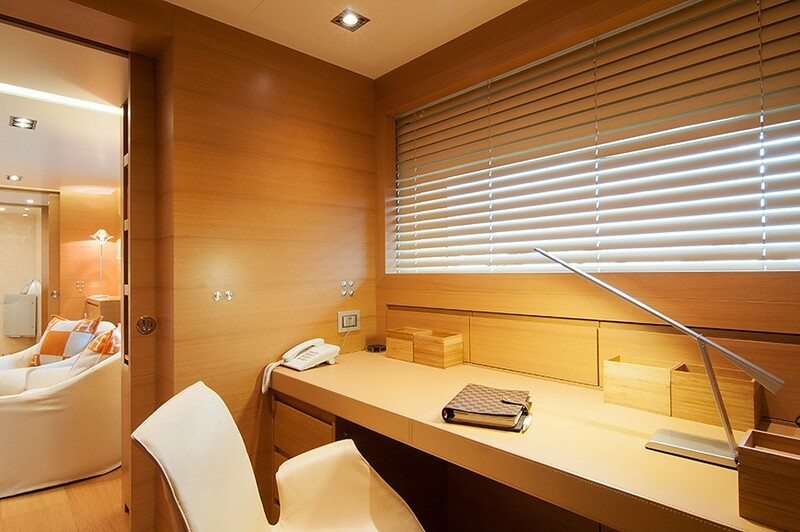 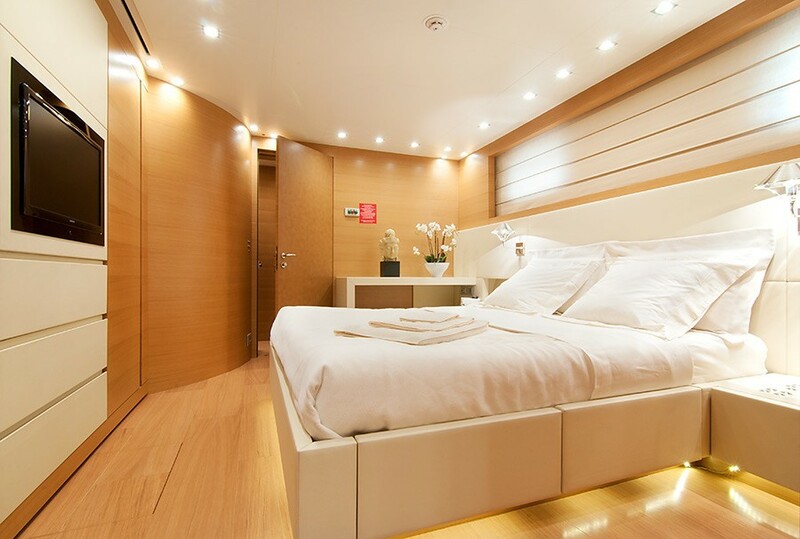 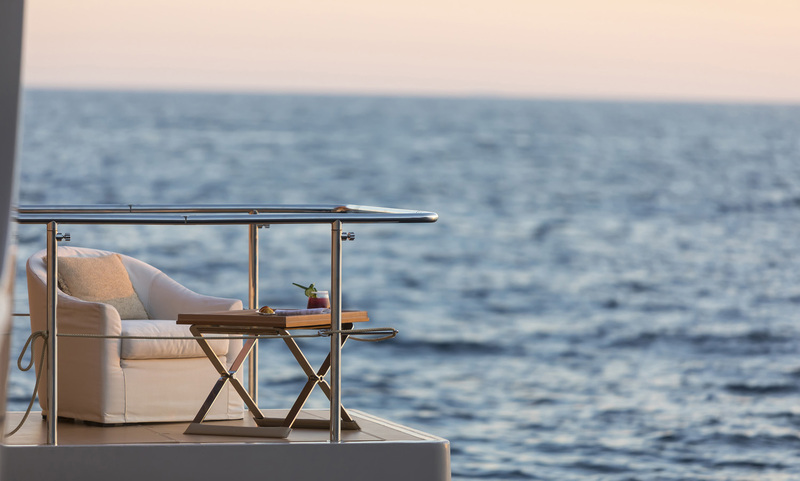 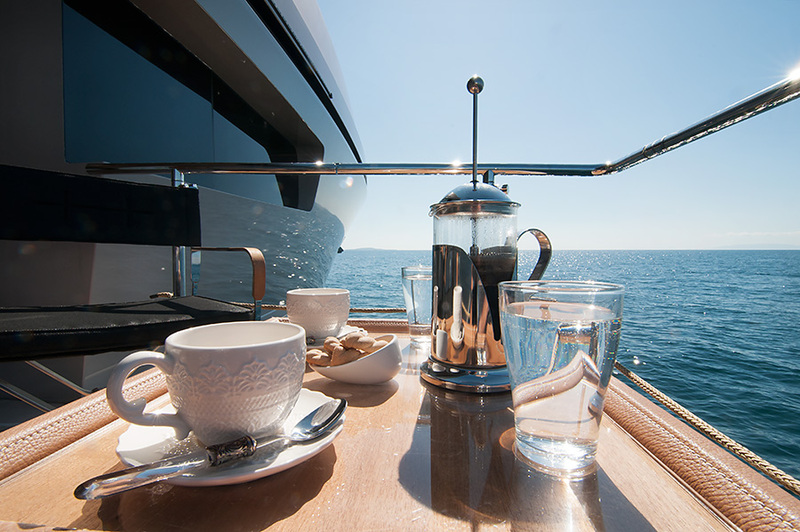 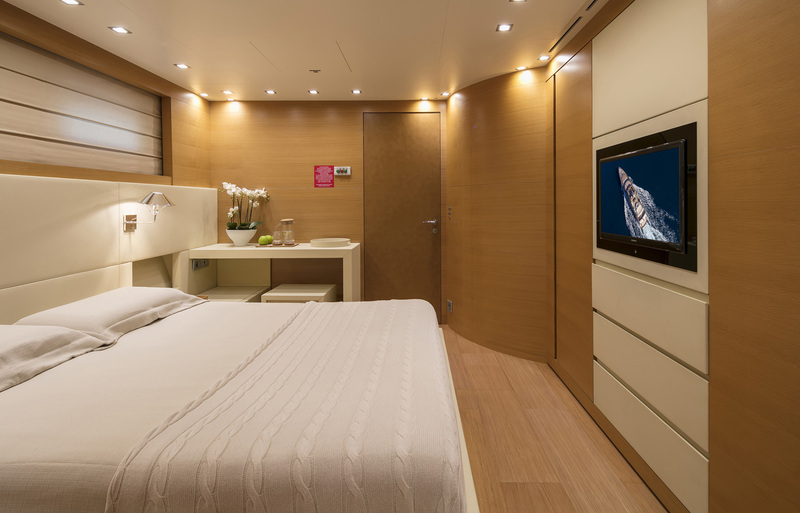 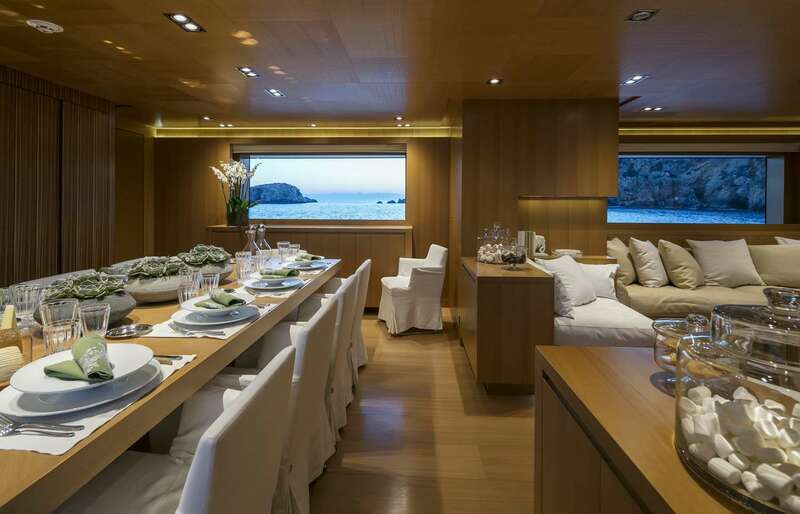 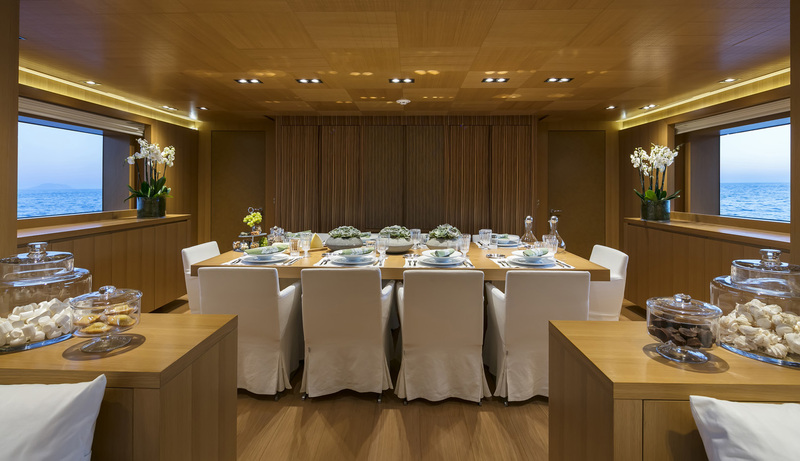 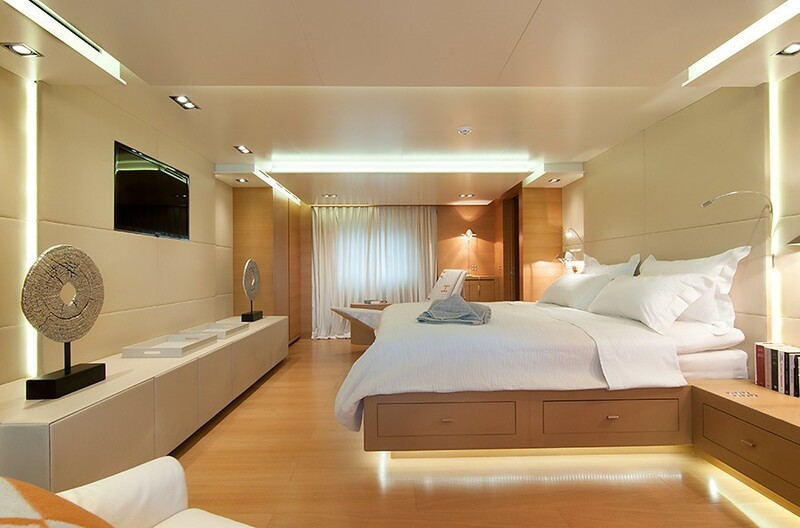 Throughout the yachts, social spaces and private cabins, are state of the art entertainment and communication systems. 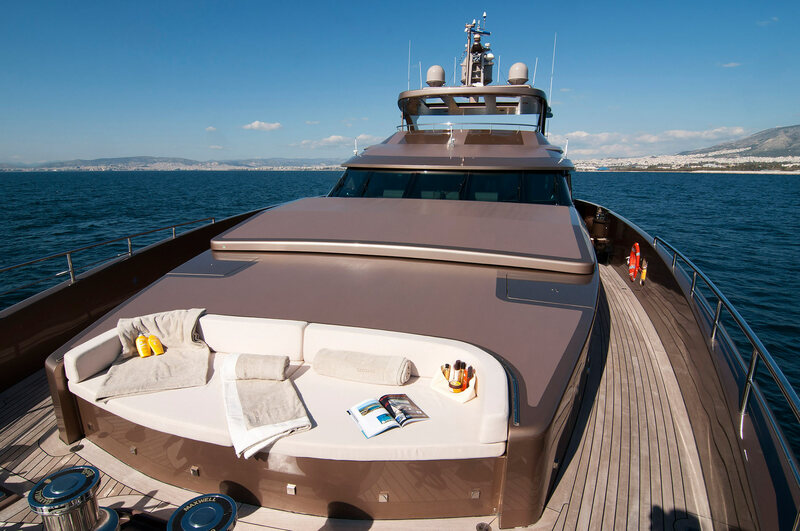 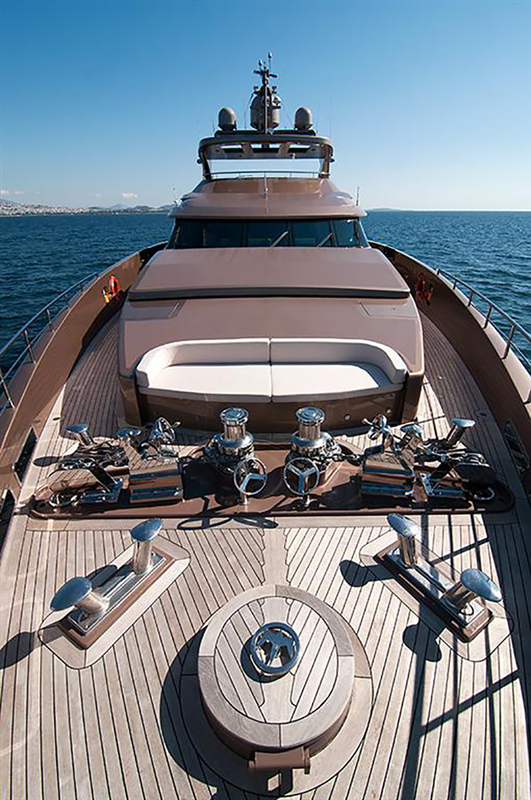 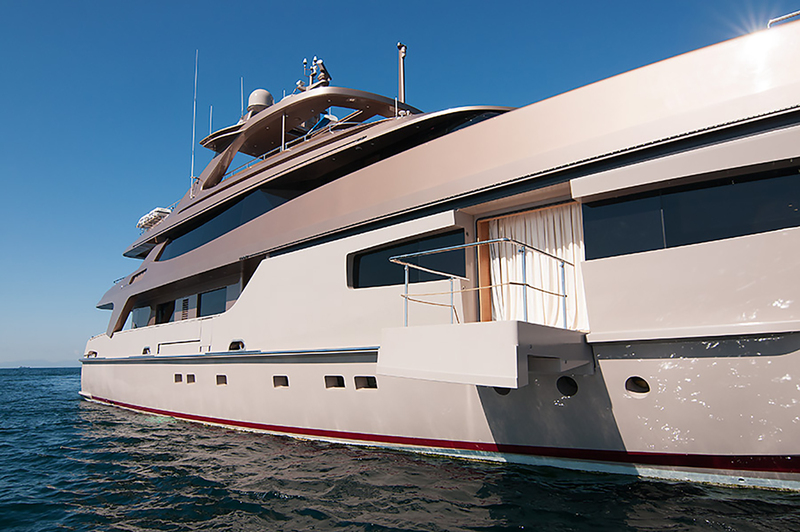 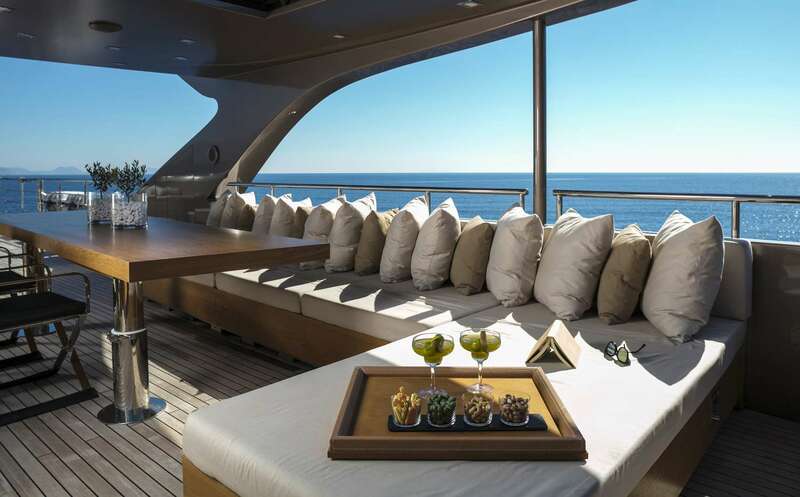 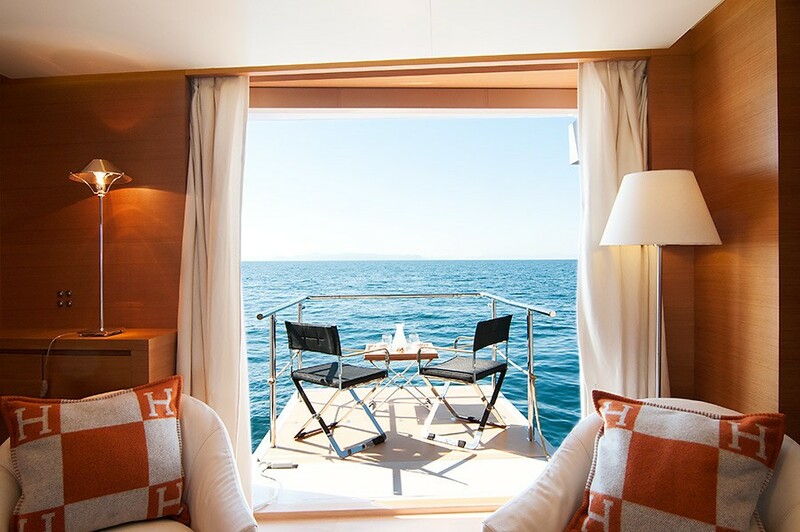 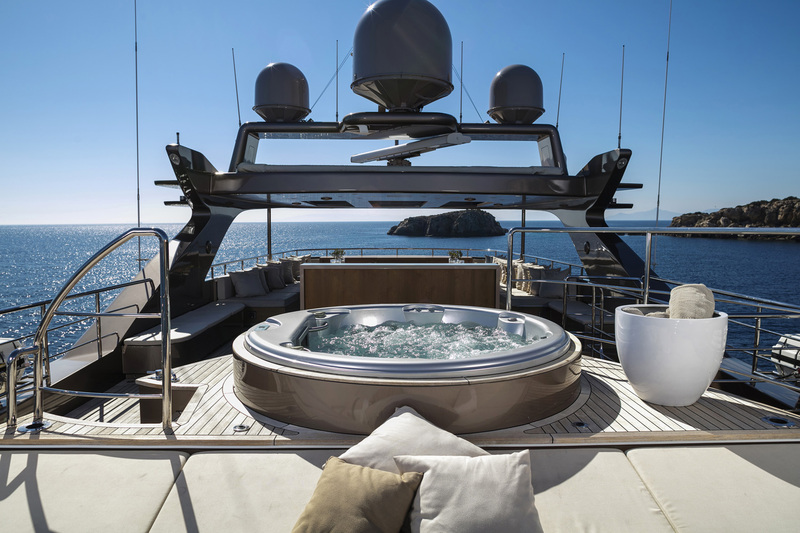 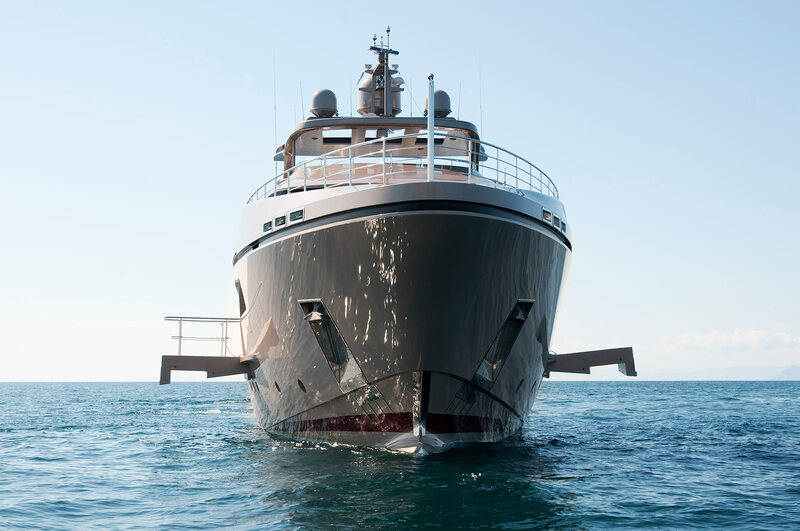 On deck, this luxury yacht is well-appointed, ideal for luxury charter, whether for relaxing or entertaining. 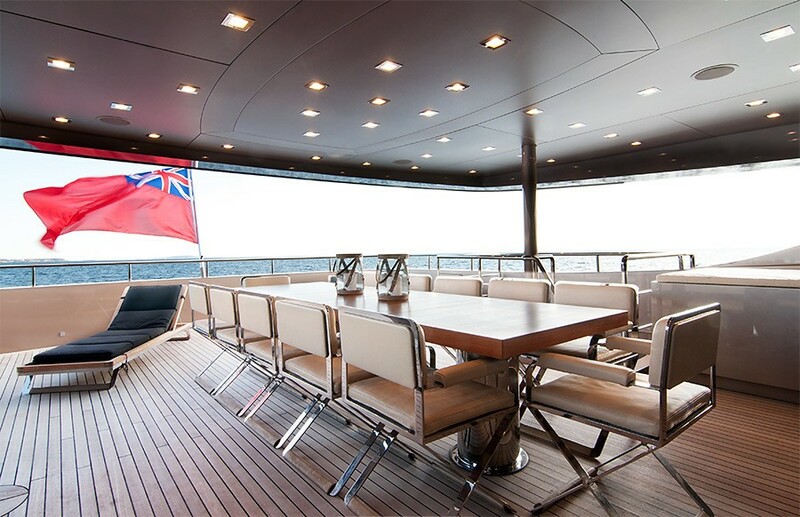 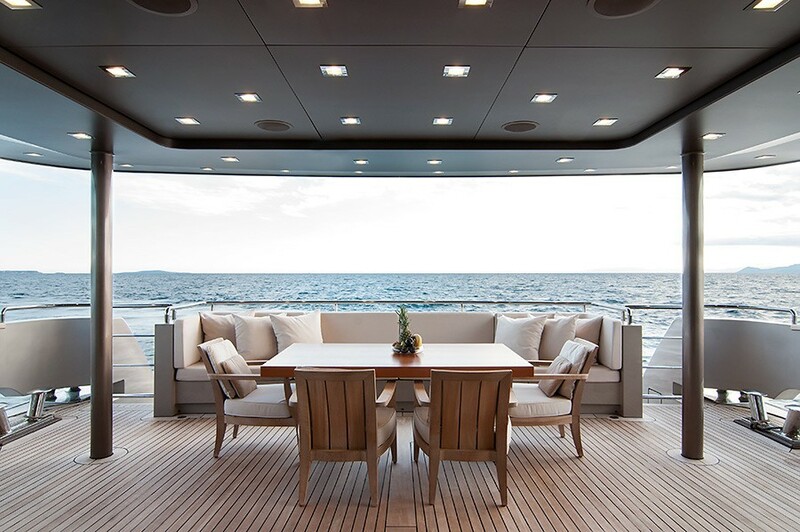 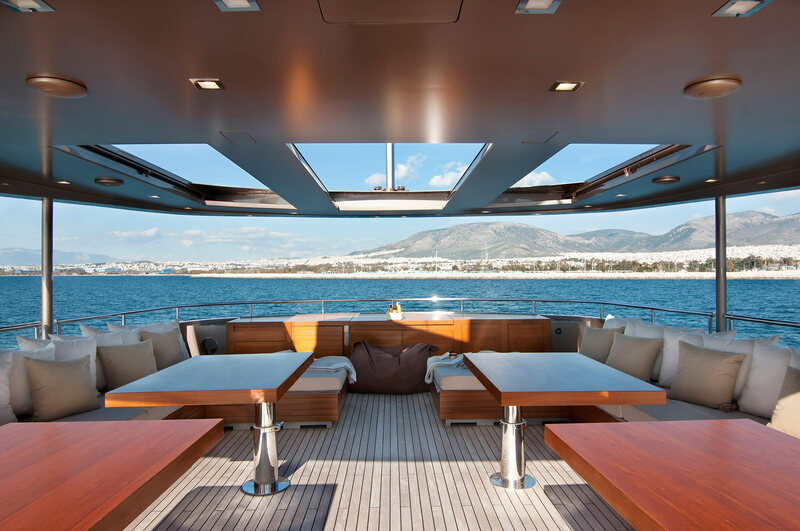 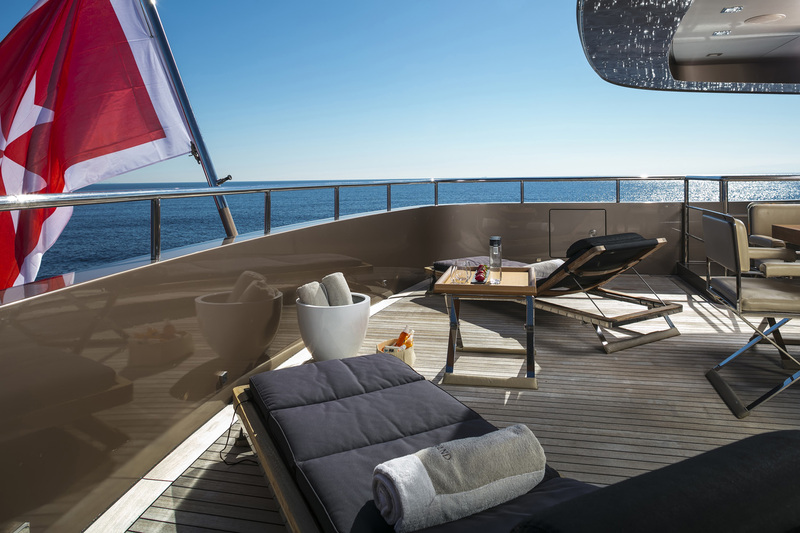 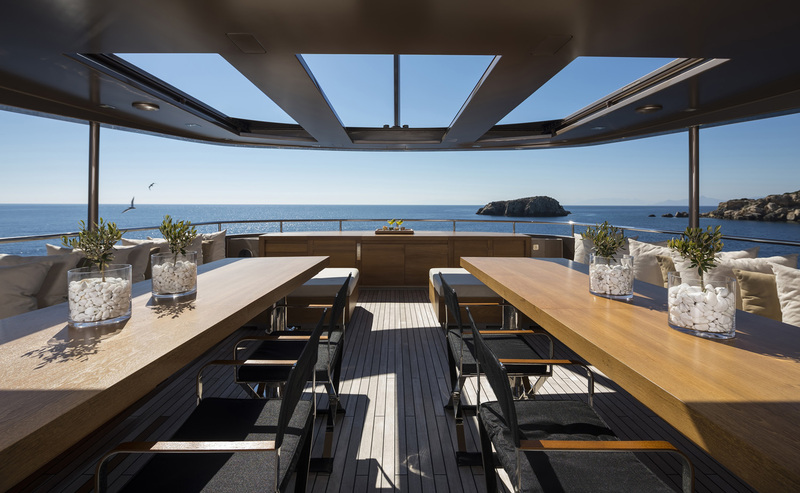 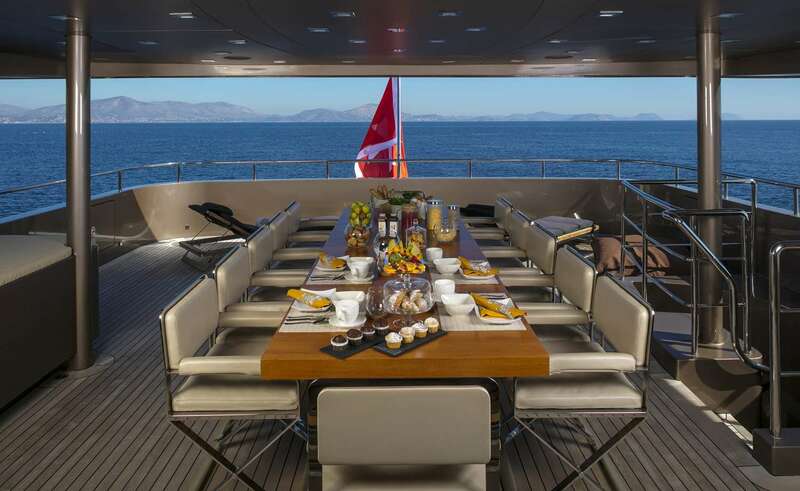 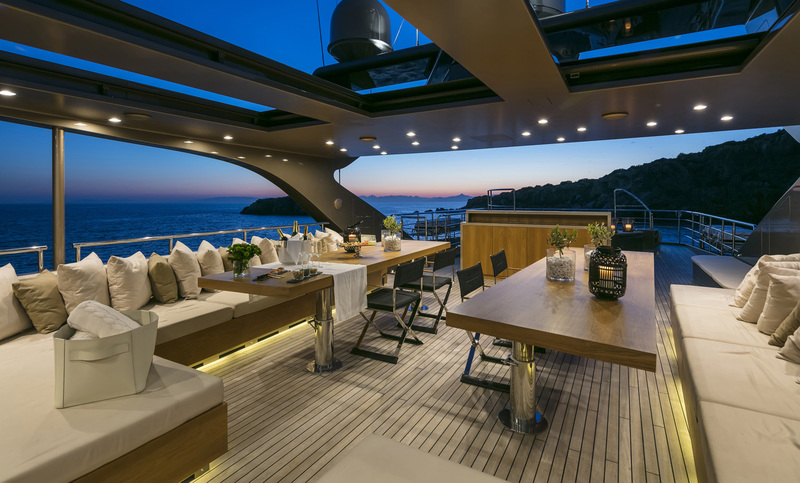 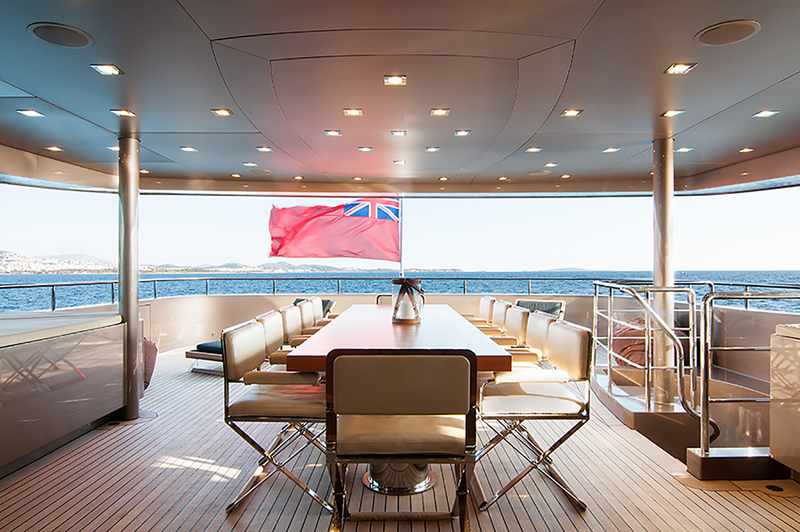 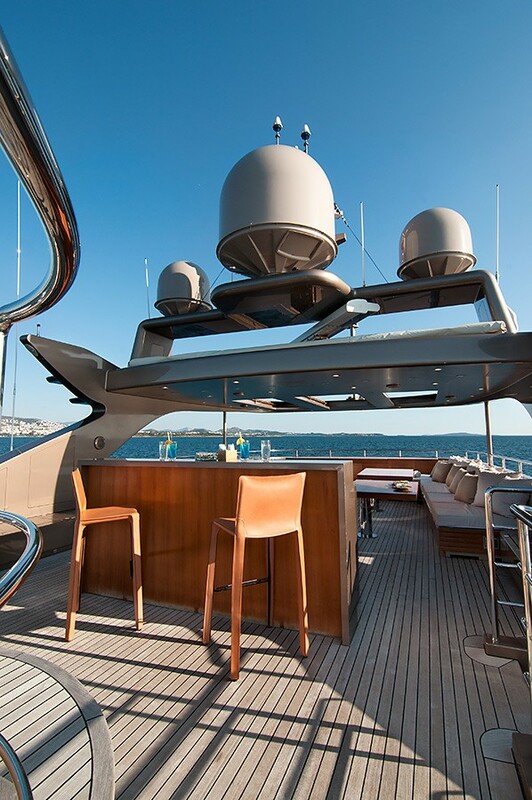 The aft deck, which is easily accessed from the main salon, boasts a shaded area with a table and comfortable seating. 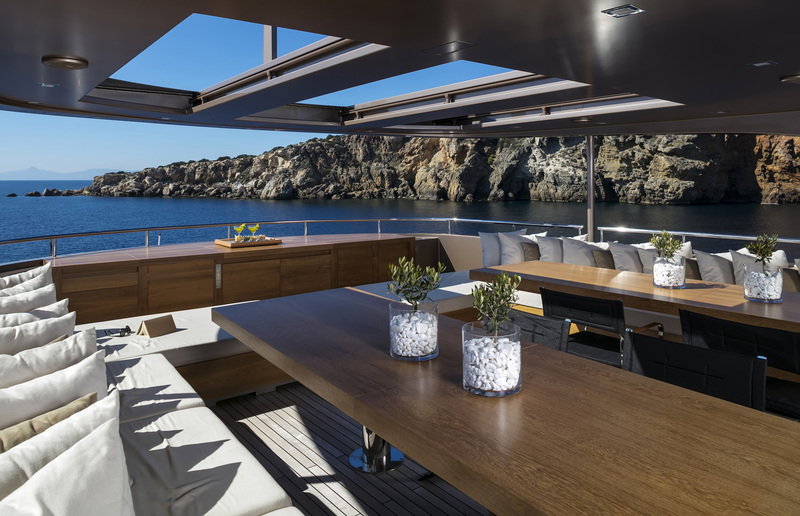 Dual steps lead to the swim platform and toys garage, making enjoying the good array of tenders and toys on offer effortless. 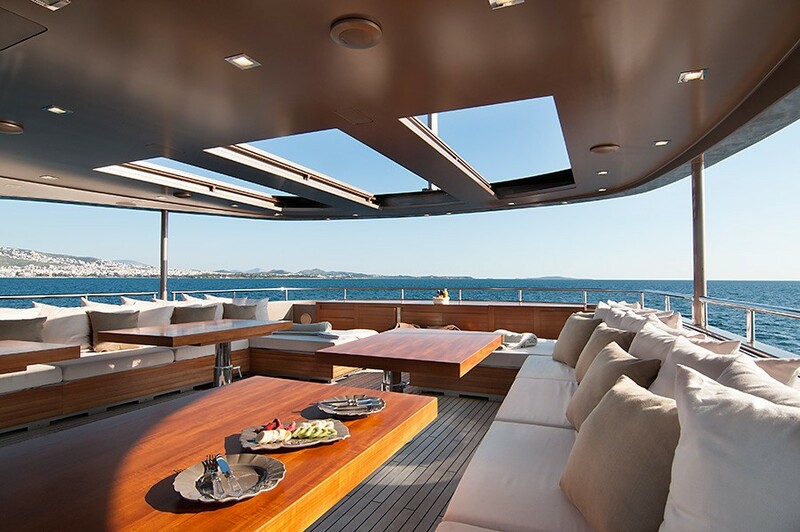 The upper deck has a table, sun loungers, and partial shade. 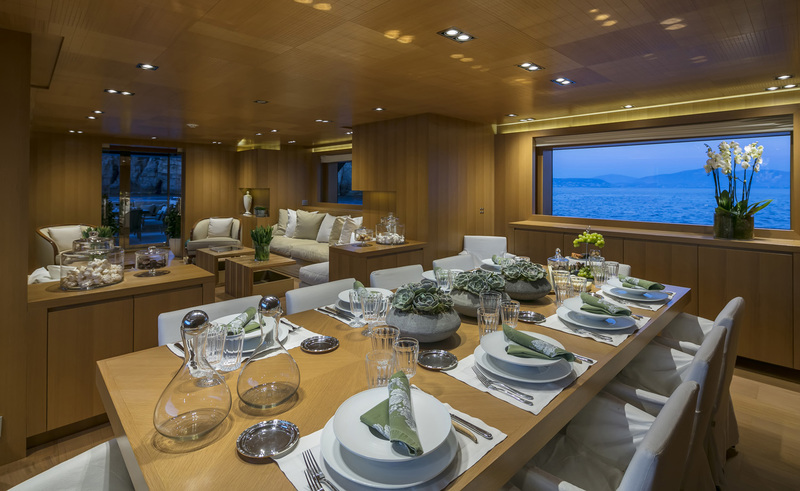 With direct access to the upper salon, it is perfect for evening cocktails followed by a fine dining, alfresco style. 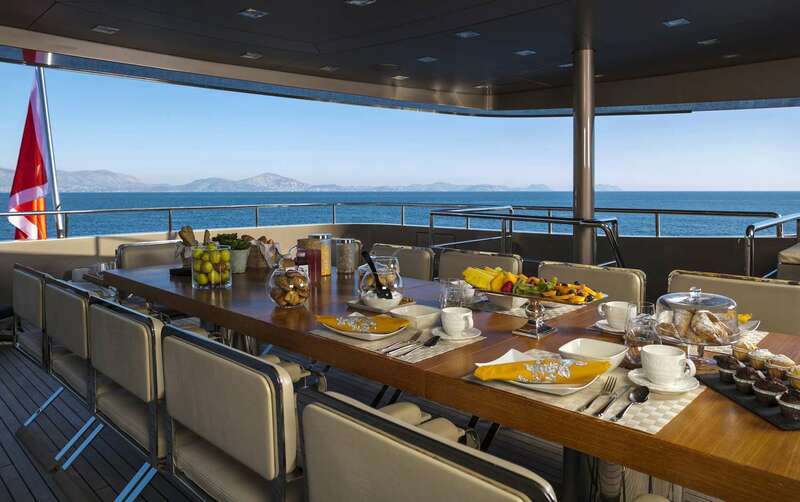 Forward on the upper deck, guests will find a more private sun pad and seating area. 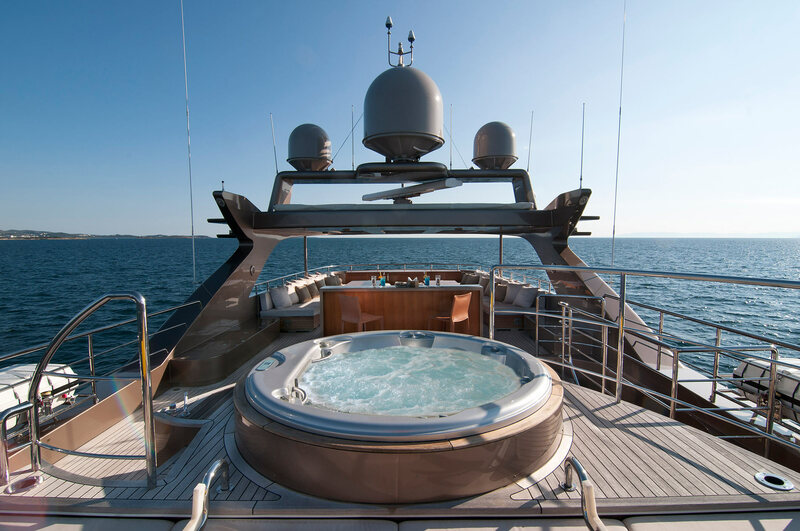 The top sundeck is impressive, complete with a large sun pad, deluxe Jacuzzi, seating with tables, optional partial shade, and wet bar. 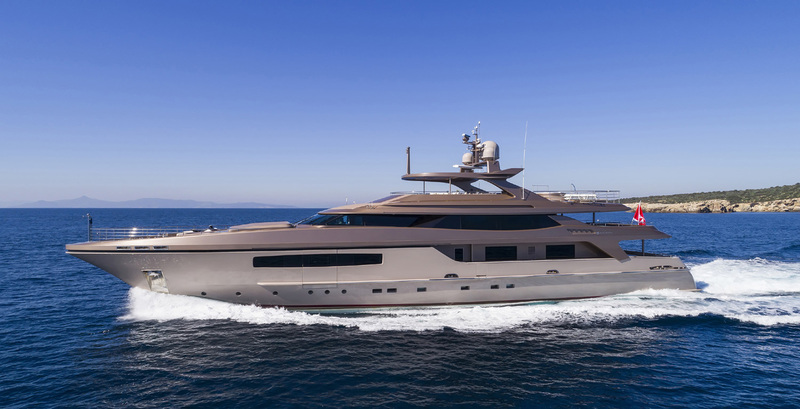 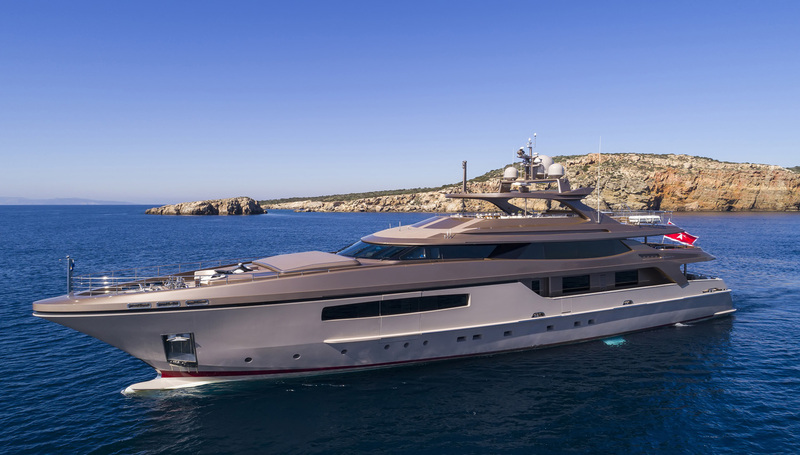 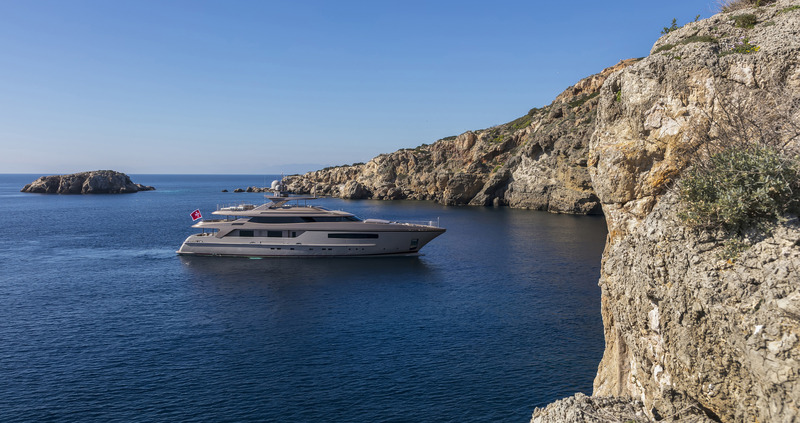 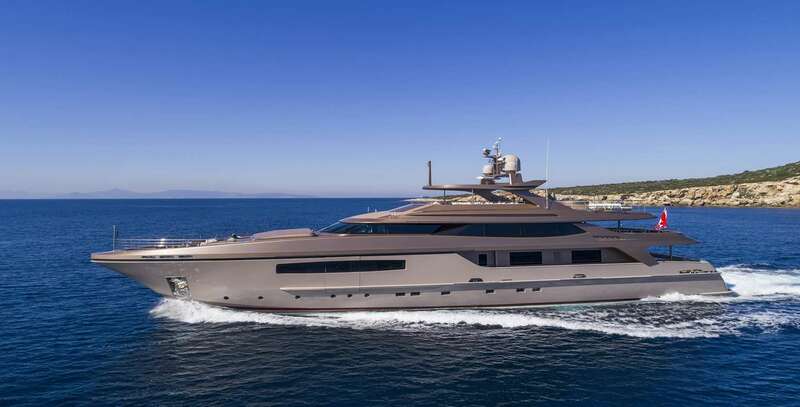 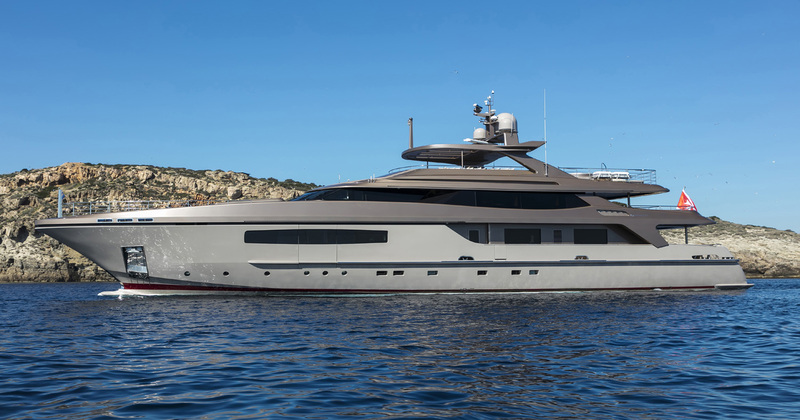 All-aluminium superyacht GEOSAND is powered by twin MTU 12V 4000 M90 diesel engines. 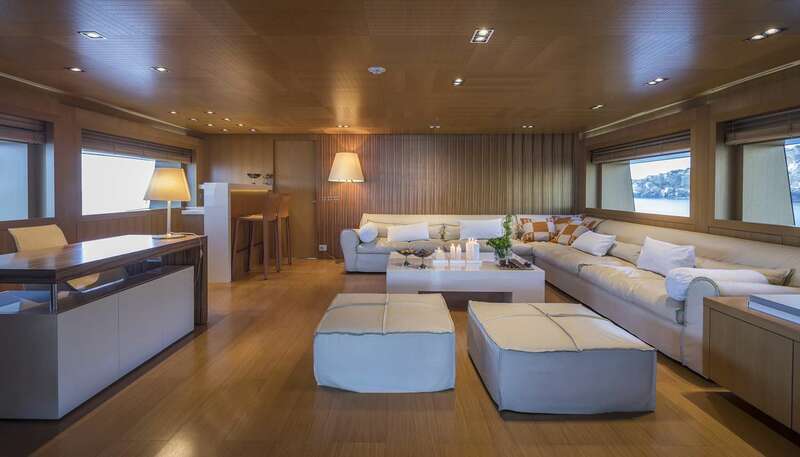 ABS classed, and with a beam of 8,5m (27'89''), this amazing yacht offers comfortable cruising to her guests. 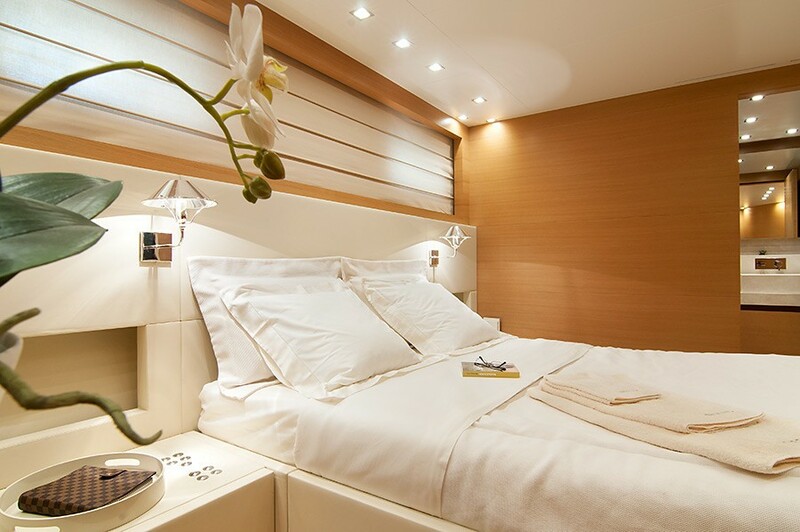 Accommodation is in 5 guest cabins, with an optional 6th upon request. 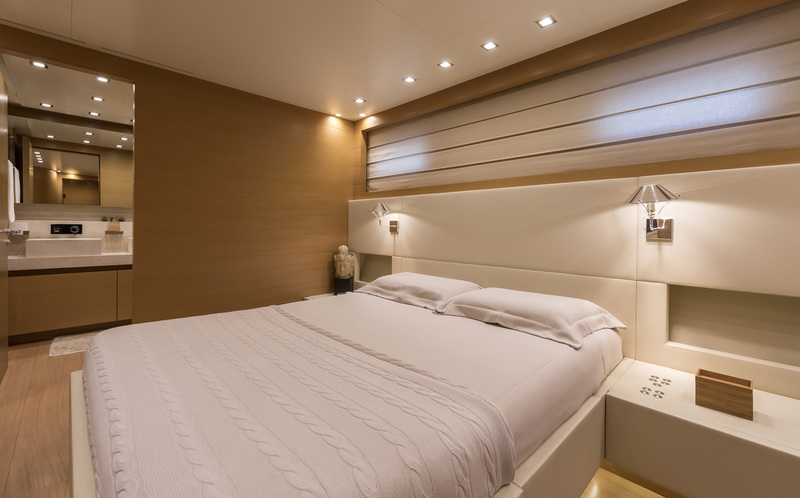 The master stateroom is full beam of the yacht on the main deck forward of the salon, with a king size bed, study, walk in wardrobe, and 2 private balconies. 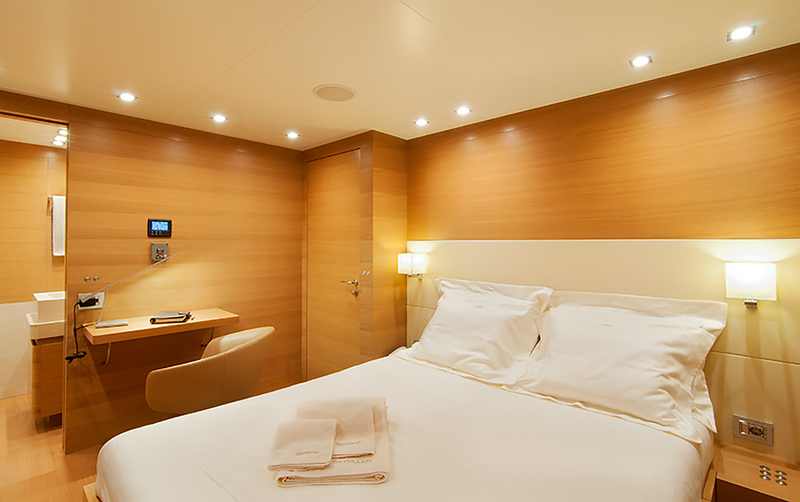 On the lower deck are 2 mirror image VIP cabins and 2 twin cabins, with upper Pullman berths each. 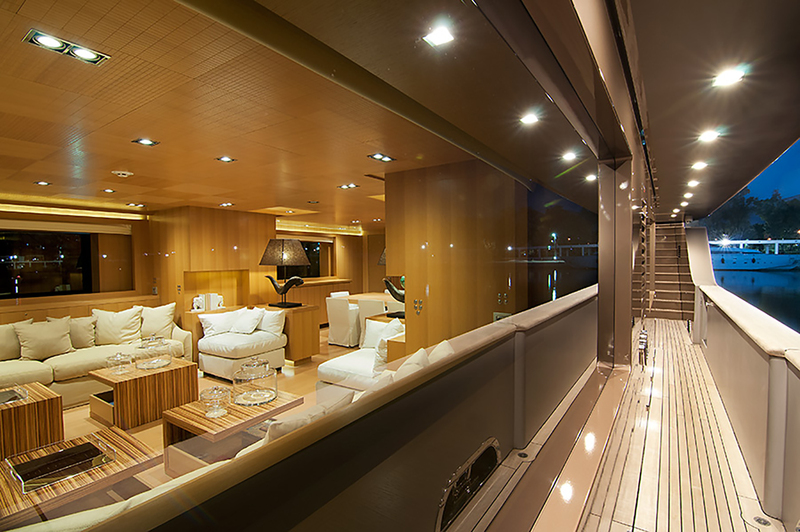 An optional queen cabin is located on the upper deck. 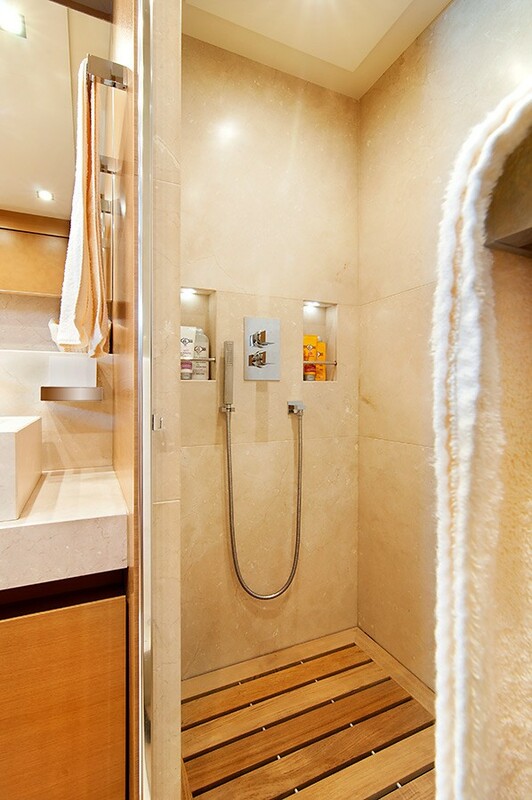 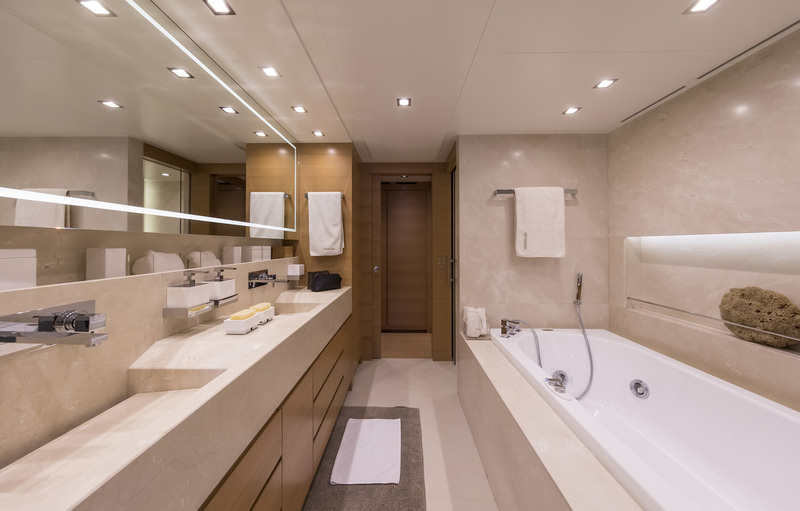 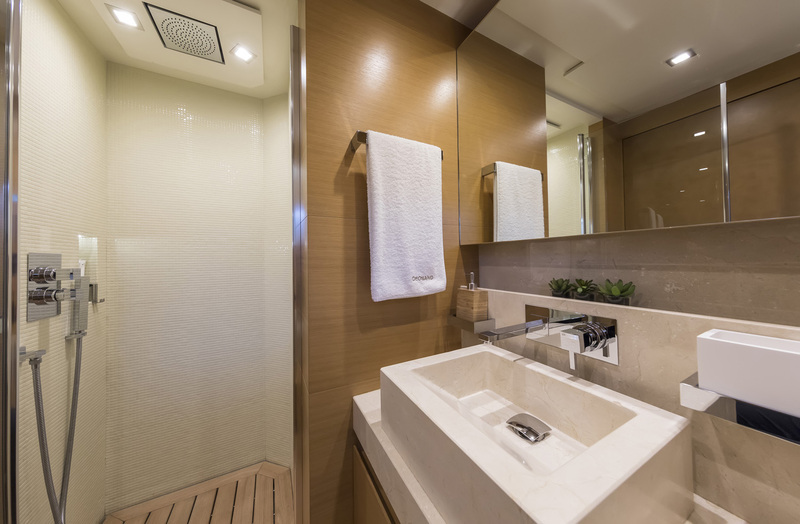 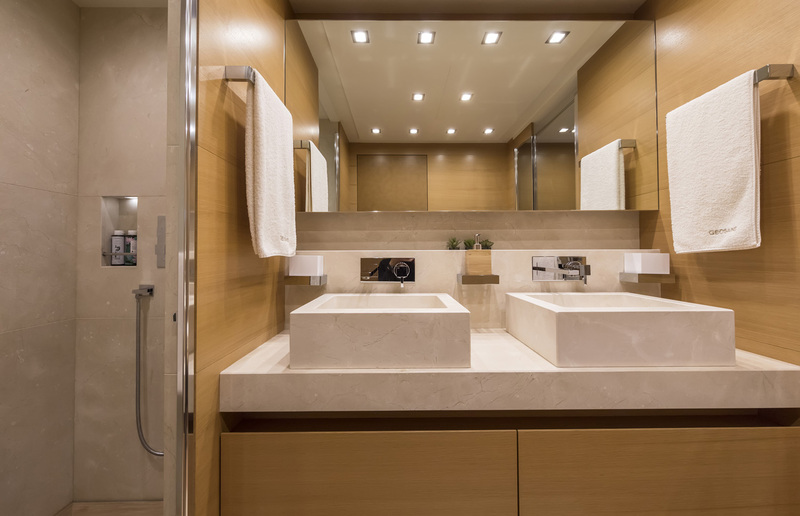 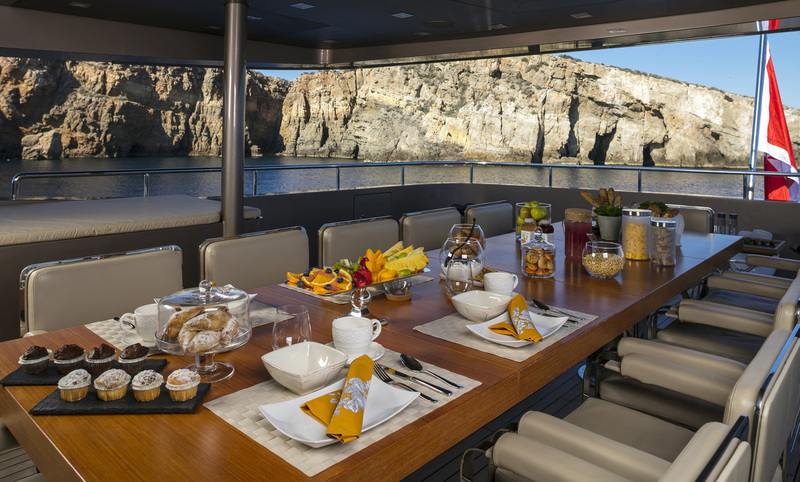 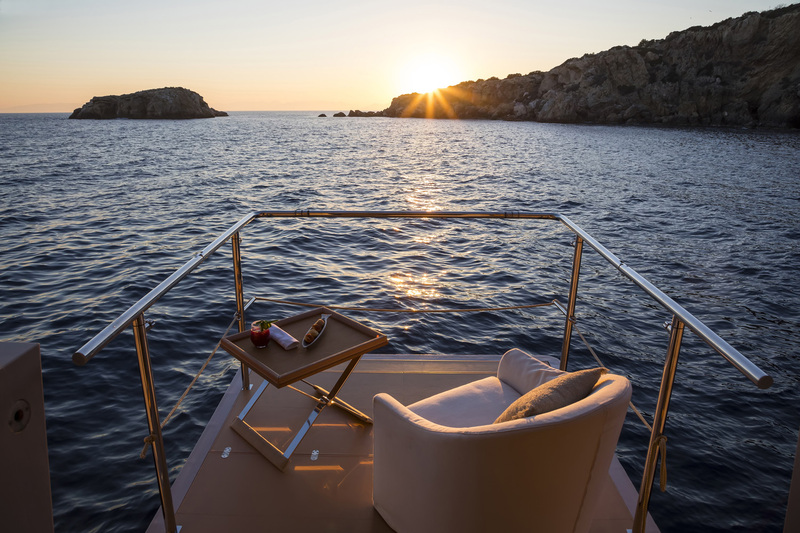 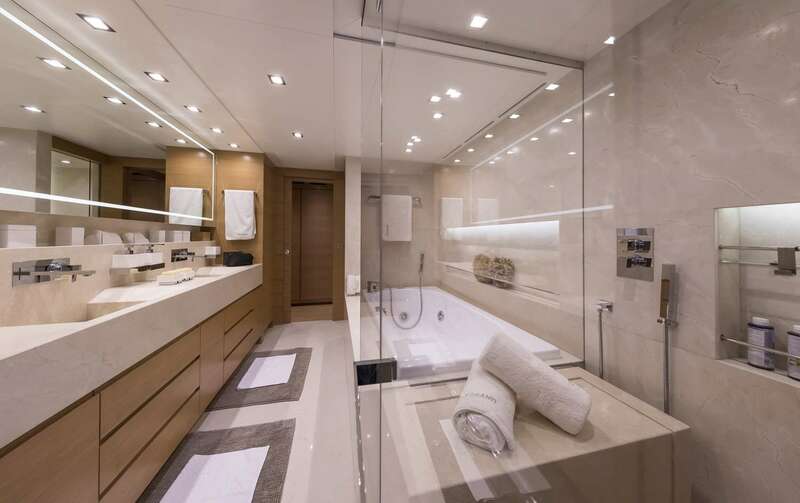 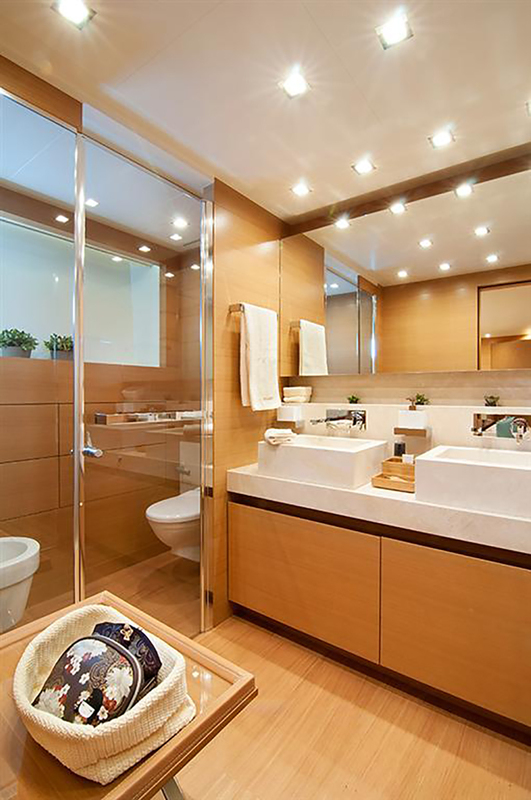 All cabins are finished to a high standard, boast exceptional space and have private en-suite facilities and full entertainment and communication systems.